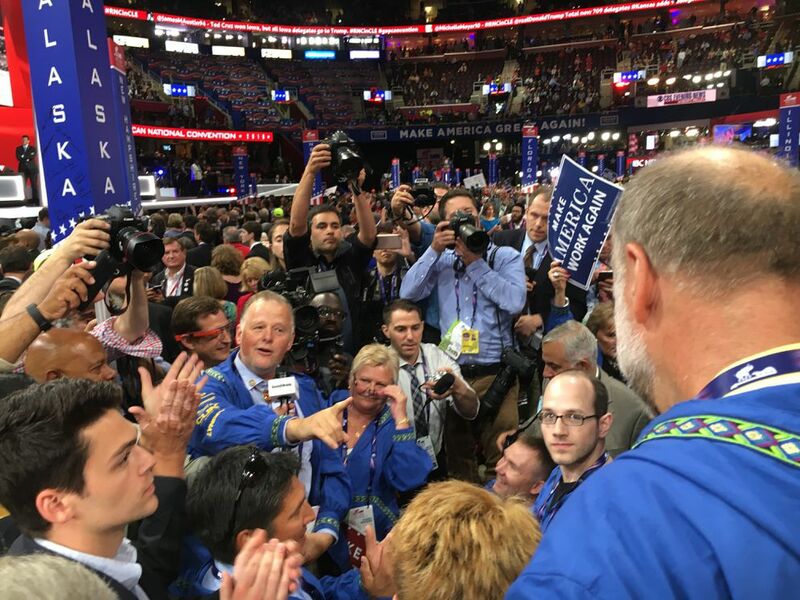 Alaska's delegates to the Republican National Convention erupted in anger on the arena floor Tuesday night when their votes were not counted as cast for the party's presidential nominee. And technically, they never will be. The Alaska Republican Party rules dictate that delegates' votes be allocated proportionally to how Republicans voted in March. That meant 12 votes for Texas Sen. Ted Cruz, 11 for Donald Trump and five for Florida Sen. Marco Rubio. But when Alaska's delegates announced the state's tally on the convention floor Tuesday night, as the tally ticked forward toward Trump's inevitable nomination, party officials ignored what they said. Instead, they announced that all of Alaska's 28 delegate votes went to Trump. "We just got cheated out of the whole damn thing. We just got cheated out of our votes," said delegate Dave Donley, as he stormed off after the vote. Trump staffers were in touch with Alaska's Trump campaign chair, Jerry Ward. The campaign was as surprised as the Alaskans, and didn't want to be attached to ill-gotten votes, Ward said. This was on the RNC. 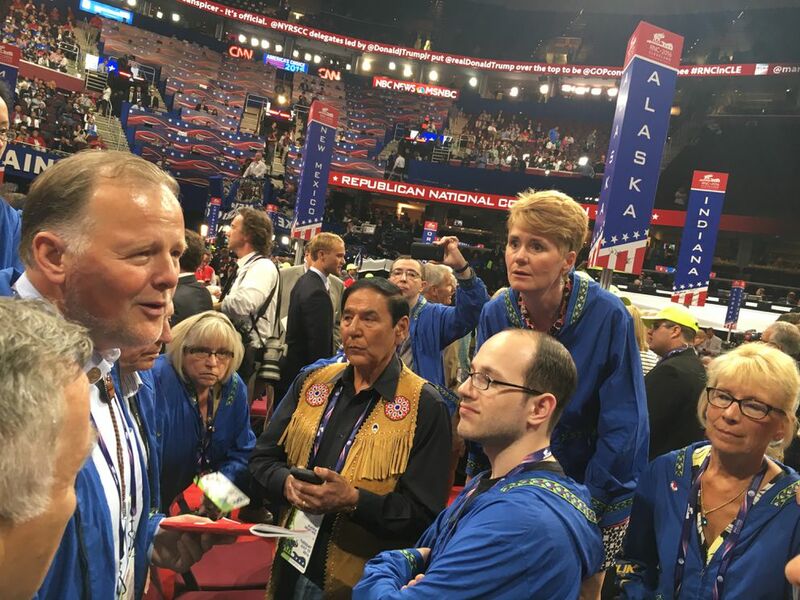 As the vote count continued on stage, the Alaska delegation huddled around state party chairman Tuckerman Babcock in their matching bright blue kuspuks to figure out what happened. Babcock had just returned from the back of the arena floor, where delegate Peter Goldberg had located an RNC attorney and aired the delegation's grievance of democracy undelivered. That's when the delegation found out for the first time that the Republican National Convention attorneys had decided that they saw Alaska's convention rules differently. Since Cruz and Rubio are no longer in the race, all of the state's delegate votes were going to Trump, the attorney told Babcock. The RNC attorneys had said nothing of their new interpretation of the rules to the delegation, the Trump campaign in Alaska, the Alaska Republican Party or its legal counsel, Babcock said. "There's no excuse for that," he said. Alaska Republicans had agreed to split the vote, in the name of bringing the party together, Donley said. "What a way to get unity, huh? Cheat people out of a vote," he said, clearly disgusted with what was happening. Delegate Judy Eledge was livid, but she made it clear: This had "nothing to do with Donald Trump." Most of the Alaska delegates say they plan to vote for Trump in the general election. But they wanted their votes counted, and many cried "corruption" at the RNC's decision. "But no one's mad at our Trump delegates. Our Alaska delegates are unified," Babcock said. "When you're in Alaska and you're as far away as you are, and you travel" nearly 4,000 miles to lend a voice to the democratic process, "that's how the record should reflect it," said Cruz delegate Casey Dschaak. "I don't know if it would make a difference, but it's how the record should reflect it," he said. Just as the delegates were sure that nothing would be done, House Speaker Paul Ryan appeared on stage and asked if any state wished to change its vote. The Alaskans — including the Trump delegates — clamored to be seen, shouting and waving their hands in the air. Donley was the first to find a microphone on the floor, where he declared that democracy was not being served — the state's vote had been miscounted. 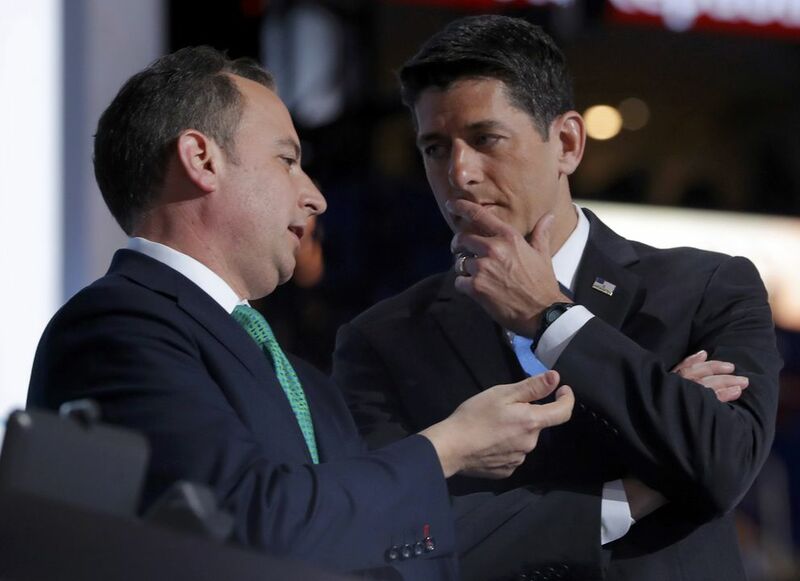 "One hundred percent of our delegation agrees that … is the vote," he told Ryan. "We were never told that you were going to miscount our votes tonight." Ryan called for a polling of the Alaska delegation, and quickly a woman in a neon orange hat appeared to recount their vote. Suddenly, Alaska was the center of high drama on the convention floor. As they huddled around the convention official, the party turned the music deafeningly loud, and a swarm of cameras and reporters closed in on the group. Some delegates struggled to make their way through to have their votes counted. When she left, they cheered. There were high-fives and big smiles. But it was for naught. Soon RNC Chairman Reince Priebus took to the stage and broke the news: sure, we counted your votes — but it's still 28 for Trump, the party's lawyers say so. The Alaskans booed in disappointment. "It's something any centralized authority always has to careful of — how you treat the remote areas," Babcock said. "Whether it's the RNC reinterpreting our rules for us, or Washington, D.C., bureaucrats reinterpreting regulations for us, it's still very frustrating for Alaskans." 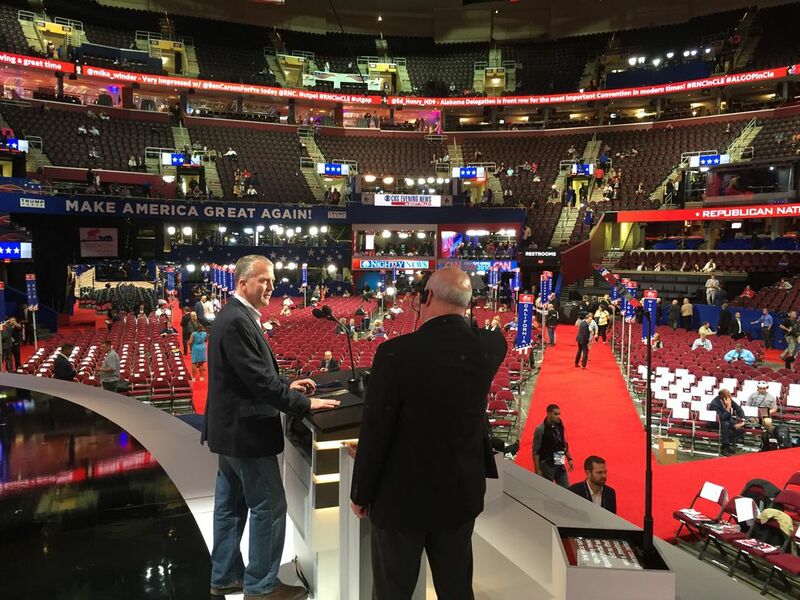 Alaska Sen. Dan Sullivan will address millions of viewers at home tonight when he makes his primetime debut on stage at the Republican National Convention. The convention begins at 1:30 p.m. Alaska time Tuesday (5:30 p.m. EST). Speeches begin whenever delegates are done with voting, so it's a bit difficult to gauge a start time, and convention officials have not released a timeline publicly. It will likely be around 5 p.m. Alaska time. It won't be a long "keynote" speech — Sullivan will only speak for a few minutes. He will be joined onstage by the nine other freshman Republicans who were voted into office in 2014, when the GOP took back the Senate majority from Democrats. The general idea is to rally the GOP troops by reminding everyone of the party's sweeping midterm win two years ago. The presidency isn't the only race on the ballot this year: There are 34 Senate seats up this year, and 24 of them are currently held by Republicans. Right now, there are 54 Senate Republicans, 45 Democrats and one Independent — Maine Sen. Angus King, who caucuses with Democrats. It won't take but a handful of gains by the Democrats to regain control of the upper chamber. You may remember that Sullivan is actually ranked #100 — dead last — in the Senate's ranking of seniority. (After time in office, senators are ranked using prior elected office experience and then state population as metrics.) So how did he manage to nab the microphone at the convention this year? Sullivan and his co-GOP-freshmen get together every two weeks for a meal, and in May, Sullivan and four other freshmen — Joni Ernst of Iowa, David Perdue of Georgia, Tom Cotton of Arkansas and Cory Gardner of Colorado — joined Arizona Sen. John McCain on the campaign trail as a group. Sullivan said the point of his time on the convention stage is to "remind the people in the convention hall" that Republicans came together in 2014 to build "a really strong freshman class." Michigan Sen. Gary Peters was the only new Democrat to join the Senate in 2014. "And I'm going to brag about a lot of my colleagues," talk about economic opportunity, and remind convention attendees that the 2014 GOP coup took Sen. Harry Reid (D-Nevada) out of the Senate's top slot. Reid is an oft-reviled figure among the GOP rank-and-file. After dramatic infighting on the convention floor Monday, the delegates quickly passed the official "platform" that was written by committee the week before. The platform is a guidepost for the party: Here's what we believe in, and here's what we want to do. There's something near and dear to some Alaska delegates' hearts in this year's platform — turning federal land into state land, at least when in comes to energy production. The federal government owns or controls over 640 million acres of land in the United States, most of which is in the West. These are public lands, and the public should have access to them for appropriate activities like hunting, fishing, and recreational shooting. Federal ownership or management of land also places an economic burden on counties and local communities in terms of lost revenue to pay for things such as schools, police, and emergency services. It is absurd to think that all that acreage must remain under the absentee ownership or management of official Washington. Congress shall immediately pass universal legislation providing for a timely and orderly mechanism requiring the federal government to convey certain federally controlled public lands to states. We call upon all national and state leaders and representatives to exert their utmost power and influence to urge the transfer of those lands, identified in the review process, to all willing states for the benefit of the states and the nation as a whole. The residents of state and local communities know best how to protect the land where they work and live. They practice boots-on-the-ground conservation in their states every day. We support amending the Antiquities Act of 1906 to establish Congress' right to approve the designation of national monuments and to further require the approval of the state where a national monument is designated or a national park is proposed. The federal government owns roughly 222 million acres of land in Alaska — about 60 percent of the state, and more land than in the entire state of Texas. So why would Alaska want Congress to transfer all its land over to the state? Resources: The federal government is the traffic cop for all sorts of resource development in Alaska. As some Republicans see it, there would be a lot more in the way of oil and gas drilling, mining, and cutting timber if the state were in charge. And requiring state approval when the president designates national monuments could prevent the president from using the Antiquities Act to block more waters and lands from drilling and mining. Some delegates say they think it could really happen — but only if Donald Trump lands in the White House. So that it doesn't go without saying: The House and Senate would have to stay in Republican hands as well. Even then, the idea would gain pretty significant pushback from many lawmakers in Washington, D.C. It's worth noting: the National Park Service celebrates 100 years on August 25. The federal government is celebrating the centennial all year long. Elsewhere, the platform also calls for Congress to "give authority to state regulators to manage energy resources on federally controlled public lands within their respective borders," which seems a lot like a close second place option to turning the land completely over to states. The environment is too important to be left to radical environmentalists.They are using yesterday's tools to control a future they do not comprehend. The environmental establishment has become a self-serving elite, stuck in the mindset of the 1970s, subordinating the public's consensus to the goals of the Democratic Party. Their approach is based on shoddy science, scare tactics, and centralized command-and-control regulation. Over the last eight years, the Administration has triggered an avalanche of regulation that wreaks havoc across our economy and yields minimal environmental benefits. Check out the full platform below for the rest of the Republican Party's official belief system: Final 2016 Republican Platform. 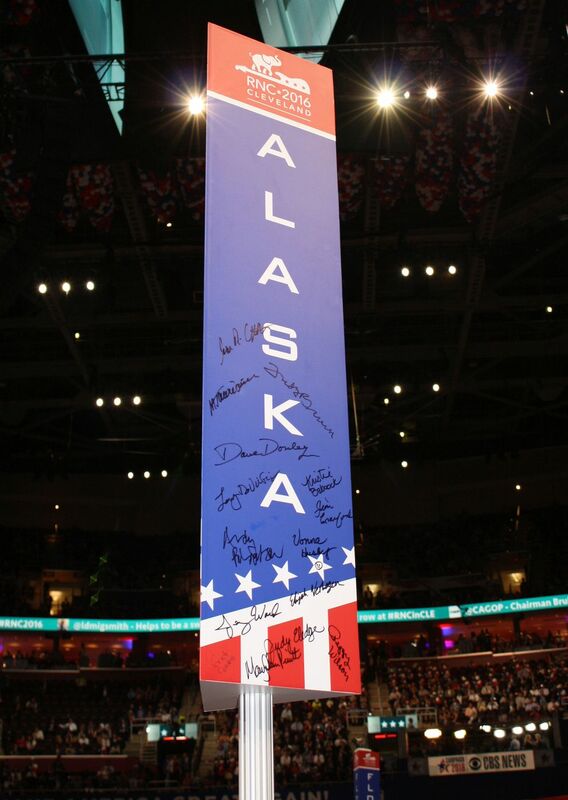 ADN reporter Erica Martinson is in Cleveland covering Alaskans and Alaska issues at the Republican National Convention.